>> How Much Weight Can a Trampoline Hold in Reality? Trampolines are becoming common in almost all the households as they provide endless entertainment and fun to the kids and adults. However, there are some things that you should take care of. You need to figure out the weight limit of a trampoline so that no accidents are caused when more people start jumping on the trampoline at the same time. When you purchase the trampoline, you will be informed about the weight limit that the trampoline has. Nonetheless, trust is an important factor. And, you cannot just trust the weight limit mentioned, you need to carry out your own research as well to remain safe. Right? Why do You Need to Understand the Weight Limit? Earlier, trampolines were only designed for the kids. Whenever you would go to any party for the kids, you could definitely spot a trampoline with the kids jumping up and down. Well, this concept has now changed, and both the adults and kids can equally enjoy the trampolines. In fact, trampolines are used by people to exercise on a daily basis. Knowing how much weight a trampoline can bear is crucial so that you can keep yourself safe. If the weight exceeds, the spring of the trampoline can break, or the mat can tear on all a sudden. This can lead to a huge accident. To be safe and to keep your trampoline in proper order, you need to have an idea about the weight-bearing capacity of your trampoline. Why do Trampolines have Weight Limits? It is true that when the weight exceeds, there are chances that the mat and the spring of the trampoline can get damaged. However, this is not all. Weight limits are set so that the unit can operate smoothly. The materials that are used for making a trampoline should be capable of returning the force that is exerted downwards by an individual with the similar upward force. This is why the trampolines have springs. Take for example; if dense spring materials are used for making a trampoline, used by a person who is lightweight, the person will not be able to have fun. This is because the downward force generated by him is not strong enough to produce the upward force, which is equivalent. On the other hand, if a bulky person uses this same trampoline, he will enjoy more in comparison to the thin person because the downward and the upward force will be equivalent to each other. Similarly, if a fat guy uses a trampoline that is not capable of handling his weight, there are chances that the device will break as the downward force is exceeding. This is the reason why good quality trampolines will have the weight limits declared. In addition, the weight limit allows an individual to remain safe. Nobody wants to face accidents when they are supposed to be having fun. Thus, before you take your purchase decision, you should understand the weight that the trampoline is capable of bearing. The weight limits of a trampoline are dependent on the springs, jumping pads, and the frames. Other than that, the size of the trampoline also helps to decide the weight that a trampoline can withstand. The toddler trampolines are the smallest models that are available. As the name goes, these trampolines are meant only for the toddlers. These trampolines can handle weight between 75 and 150 pounds. They can fit in your backyard easily and are perfect for your kids as they do not take up much space. A 12-foot trampoline has a weight limit of 250-350 pounds. 14-foot trampolines can hold weight up to 300 pounds. A trampoline of 15 to 16 foot can support weight up to 400 pounds. The trampoline design is known to influence the weight limit to a great extent. Rectangular trampolines can bear up to 450 pounds, whereas the circular trampolines have weight limits of 400 pounds. If you opt for a brand that is cheap, it will be impossible for you to decipher the weight limit. On the contrary, if you purchase quality trampolines from the reputed brands, they will clearly state the limit of the trampolines. A trampoline from a reputed brand is mostly capable of bearing 400-450 pounds of weight. One of the best-known trampoline brands; SpringFree can accommodate around 330 pounds of weight, which is almost equal to 150 kg. This is why branded trampolines are considered to be perfect for the people who are heavy. Wrapping up, no matter what shape and size you buy, it is important that you have a sound knowledge of the product, or it can be harmful to your family members and you. By considering the weight aspect, you will understand which trampoline suits you the best and is made up of the correct materials for durability. 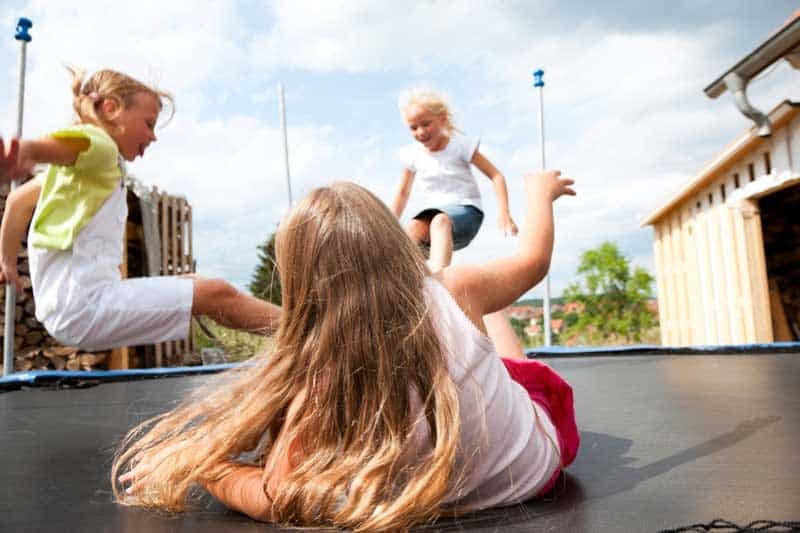 Choosing a proper trampoline will help you and your kids to develop a healthy and active lifestyle.